Cold and flu season is here again. Fight back with foods that boost gut health. 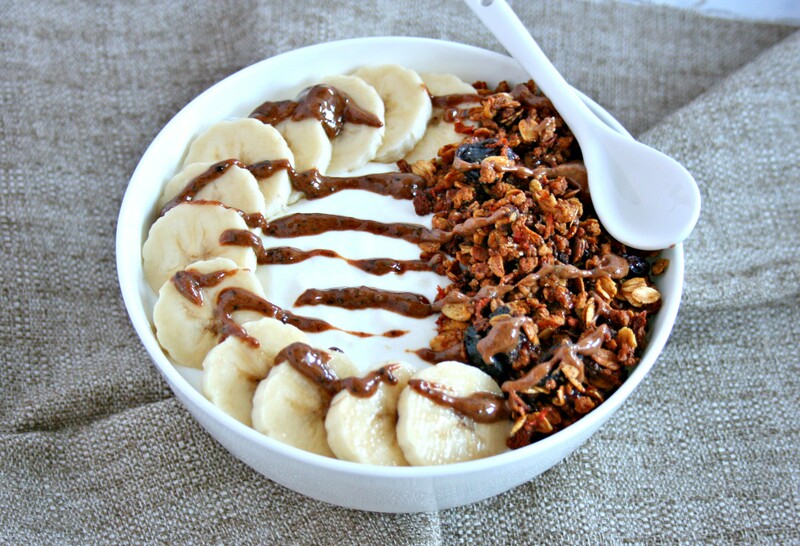 My carrot cake granola yogurt bowl is a delicious place to start! Did you know much of our immune health begins in the gut? Start warding off cold and flu season with recipes that bolster gut health. My fellow recipe “reduxers” and I have you covered. This month we are sharing ideas to amp up your immune system. Make sure to check out their recipes in the link at the bottom of this page. 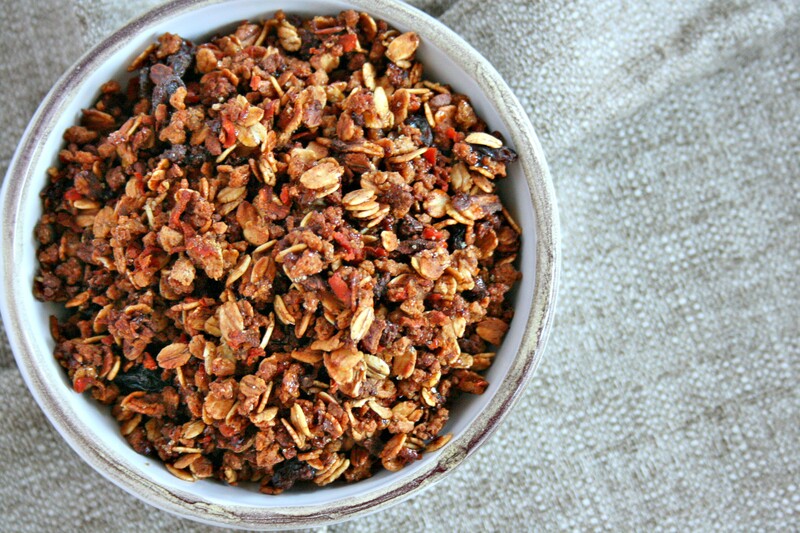 Recipes like my Carrot Cake Granola Yogurt Bowls are high in prebiotics and probiotics (the good bacteria found in your GI track). Prebiotics help promote the growth of helpful bacteria in your gut. They are found in foods like bananas, onions, garlic and whole grain foods. Probiotics are the good bacteria found in your gut. Foods like yogurt, aged cheese, sauerkraut and miso are rich in these healthy bacteria. Combine pre and probiotics together and you get the dynamic duo of GI health. 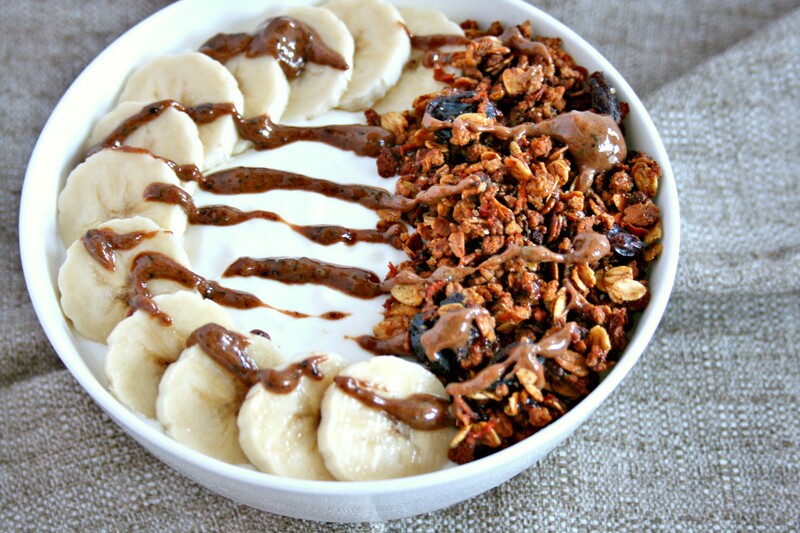 My carrot cake granola yogurt bowls include this combo: yogurt (probiotics) + bananas (prebiotics) + whole grains (prebiotics). Plus you sneak in some veggies for breakfast. Talk about a win win! Make this simple recipe for breakfast this week. Your soon to be ninja GI system will thank you! Preheat the oven to 350°F, and coat a baking sheet with nonstick cooking spray. In a large bowl, mix together the oats, grape nuts cereal, carrots, cinnamon, nutmeg, and ground cloves. In a separate bowl, whisk together the coconut oil, water, and maple syrup. Pour the maple syrup mixture into the cereal mixture. Gently stir with a spatula until all of the cereal has been coated. Transfer the cereal to the prepared pan, and bake at 350°F for 30-40 minutes stirring every 10 minutes, or until the granola reaches the desired level of crunchiness. Cool to room temperature in the pan before sprinkling the raisins on top. Transfer to an airtight container. 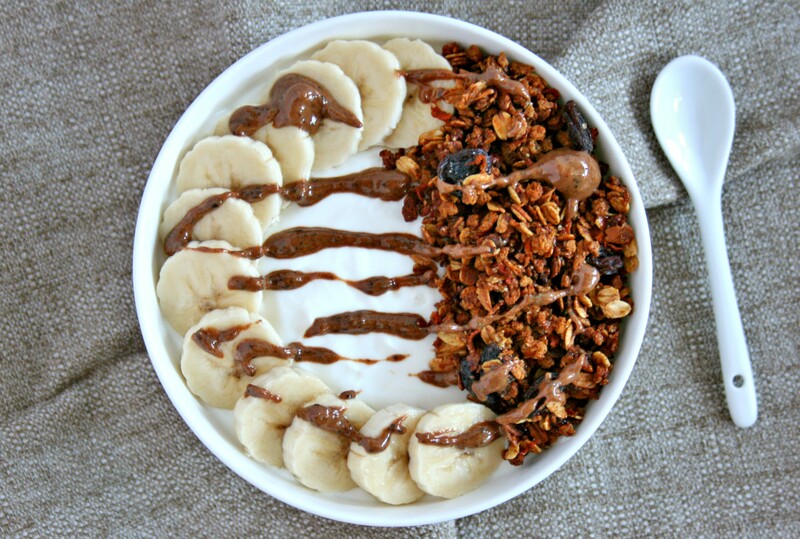 Assemble your yogurt bowl by topping yogurt with granola, bananas and a drizzle of nut butter. Love all the spices you used! Thanks Karman! 🙂 Fall flavors are the best! Carrot cake always sounds good to me but this is a much healthier way to enjoy it! Thanks, Chelsea!